Seaside-chic rules the day at charming Beach Hill Cottage, which, as its name suggests, is just a couple of minutes stroll from the seafront in the pretty village of Mumbles - a Gower coast village so crammed full of bistros and boutiques that the local press have started calling it 'The Monaco of Wales'. The 2-bedroom former fisherman's cottage nestles on a hill from where it benefits from lovely views over the coastline, best viewed from a deckchair in the safely enclosed patio garden with a chilled glass of wine in one hand, and a BBQ fork in the other, whilst junior plays happily in the toddler playhouse and kiddie car provided. Inside, the cottage has recently been given a stylish yet family-friendly revamp. Muted Farrow and Ball shades coat the walls, whilst designer fabric blinds (blackout-lined in bedrooms) dress the windows and luxury touches in the form of a Bose iPod dock, Roberts DAB radio, flat screen TV, Wii, CD/DVD Player, indulgent toiletries, 600-thread count Egyptian cotton bed linens and tasteful furnishings, plus a welcome basket from the local deli (eggs, bread, butter, jam, welsh cakes and wine)* complete the boutique hotel feel. 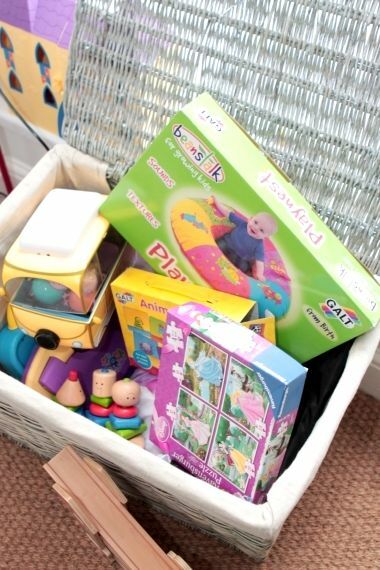 Junior guests are just as well catered for as, along with the aforementioned play house, there are several baskets of toys, a selection of books, a dressing up box and top quality nursery gear (see grey box for full list) all on hand. The house is on a hill and is approached via a short flight of stone steps. Guests enter into an open plan lounge-diner with 3-seater sofa, two armchairs, 28" flat screen TV, DVD player and Bose iPod dock. 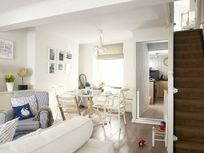 This leads onto the kitchen which is equipped with 4-ring gas hob, full-size electric oven, washing machine with combined dryer, fridge-freezer, microwave, Dualit kettle, counter top dishwasher and toaster. A stove-top espresso-maker and large cafetiere should satisfy coffee-junkies. Up a short flight of (safely gated) stairs there's a newly refurbished bathroom with romantic claw foot bath, sparkling white tiles, an over bath shower, WC, sink and airing cupboard which houses the large Mamas & Papas baby bath (could fit two! ), potties, toddler toilet seat, baby bath support etc. 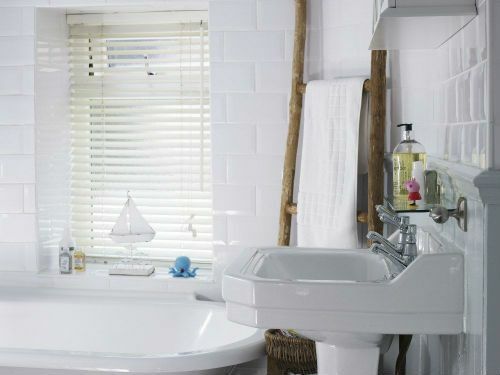 Luxury toiletries are provided for babies and grown-ups giving it a boutique hotel feel. 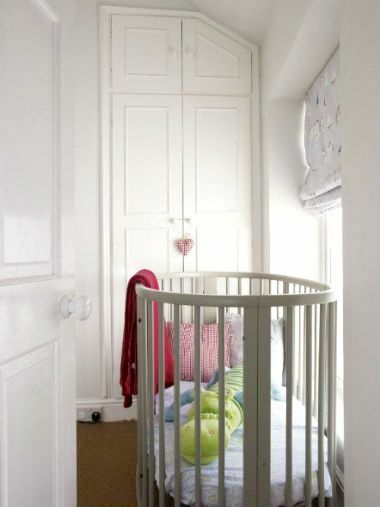 The smaller of the two bedrooms comes with a single 'captain' bed, which has a pull out trundle (sits alongside the single with a few centimetres gap, so almost a double), and a lovely Stokke cot. 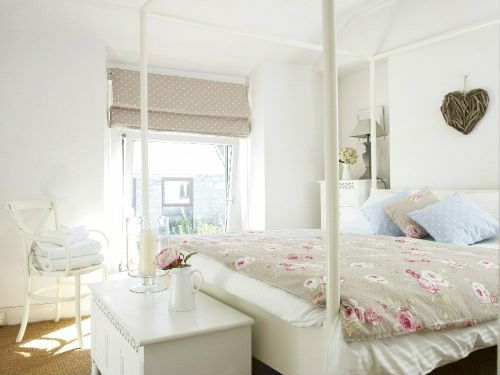 The master bedroom comes with king-sized contemporary four-poster bed and space for a second cot, as well as a retro DAB Roberts radio and views over the coastline from the window. Outside there is a patio garden with sea views. It is furnished with dining table, BBQ and kids play house. Please note, it is accessed via steps up from the house but these are safely gated top and bottom. Free on street parking is available within approx. 50-metres of the cottage or a residents parking permit can provided on request. * full welcome pack only with min. 7nt bookings Oct-Easter & all bookings - Easter-Sept. The steep approach to the cottage aside, this area is absolutely perfect for young families. There are beaches, boutiques, bistros, cafes and coffee shops within a few minutes stroll of the house, plus a fabulous little land train that departs from the seafront a few minutes walk away and travels along several miles of flat promenade to a newly refurbished lido dedicated to little ones, along with a playground and a funky wine-bar - perfect for lazy Sundays! A 15-minute walk reaches pretty Langland Bay a wide stretch of glorious sand backed by a row of pretty beach huts and yet another great little wine-bar bistro with handy kids menu. Just up the hill from there, back towards the cottage, is a well regarded Italian cafe bar and restaurant with a newly refurbished kids play area and a lovely view over the sea. A little further afield (approx.25 minutes) is the recently awarded welsh 'Restaurant of the year'; The Beach House in Oxwich Bay. This seafront restaurant has stunning views, delicious food and a handy kids menu (it's on route to Rhossili so well worth a visit after a day trip!). Wet weather needn't hold guests back either as the new 'LC2' swimming pool, about 25-minutes walk or 5-10 minutes by car from the cottage has a large indoor splash area with slides and fountains for little ones, and huge flumes for older kids or a soft play area complete with ball pit and for the little dare devils a climbing wall! There's also bowling on the pier about 10-minutes walk from the cottage and, within 1 hours drive, some of Wales' best family attractions including Folly Farm with its petting farm, zoo and indoor funfair, and Anna Ryder Richardson's highly acclaimed Manor House Wildlife Park, which manages to combine great design with well planned conservation. Literary enthusiasts can hop on the Dylan Thomas trail here with the a museum dedicated to his life being a short drive away in Swansea, and his former home, The Boathouse, being about 20 minutes away in Laugharne. Of course the sand and surf is this region's biggest attraction, the Gower coast was the first region in Britain to be listed as an official 'Area of Outstanding Natural Beauty' back in the fifties and its stunning coastline has been protected ever since with very little development, just mile upon mile of golden sands backed by green fields and hills. In fact, there are several beaches for every day of the week all within 5-20 minutes drive of Beach Hill Cottage. Surfing and kite surfing lessons can be arranged and are an ideal way to keep older siblings occupied whilst mini guests are enchanted by sand castle building and shell collecting. Parking Permit (£25) enables guests to park in residents bay approx 15-30m from front door. Free parking is usually available a little further uphill approx. 50-100m from house. We've long had a dream of owning a second home in Mumbles and retiring there one day. Phil remembers splashing about in Blackpill Lido as a toddler and, as a family, we've often blown away the cobwebs with bracing winter strolls and long sunny days on the numerous glorious beaches in the area. Now we are delighted to share it with young families just starting to make their own memories which we hope will be as fond as ours! The area is brilliant for kids. The Mumbles seafront is crammed with shells and ocean life. A pretty land train takes the strain of a trip along the long stretch from the bottom of our hill to the funky cafe and brilliant toddler-friendly splash pool at Blackpill. Then there's the numerous fabulous sandy beaches within a short drive and the Italian cafe bar with playground up around the hill, plus the pier with its hard to resist ice cream parlour on the way back. Not to mention the many lovely independent boutiques and bistros for Mum and Dad! Sleeps 4+ infants in 1 x double (king-size bed) & 1 x single with pull-out to create extra single or 1 x double. 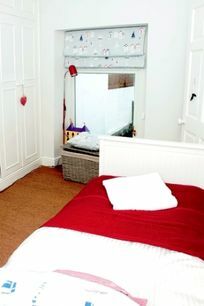 Both rooms have space for cots and share family bathroom with bath and shower over. Cardiff airport is approx. 1hr 15 minutes drive away. Beautiful beaches within a short drive including Rhossilli which was recently named Britain's Best Beach. 5 mins walk to nearest sandy beach. 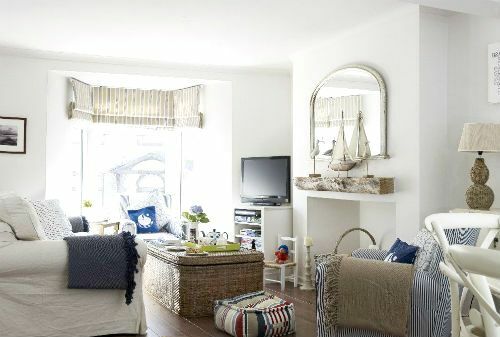 15 mins to more picturesque Langland Bay which has a child-friendly bistro. 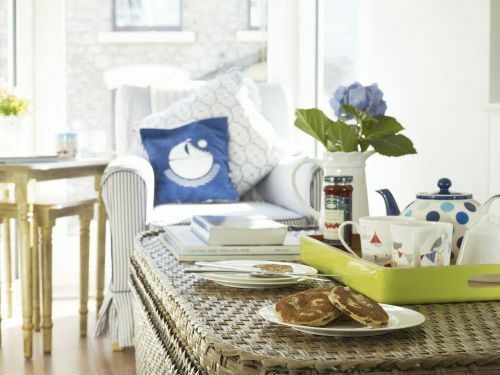 Independent boutiques, shops, ice cream shop, bistros, restaurants and cafes and a supermarket are all a short stroll away. Experienced, CRB-checked baby sitting available via the local nursery. Should be booked min 24hrs in in advance. Highly rated by past guests. Wooden and travel cot available, cot bedding, highchairs, baby bath, baby bath support, potties, toddler toilet seat, bathroom step, baby play nest, steam steriliser, baby/toddler crockery and cutlery, microwave, hand blender, changing mat, and baby toiletries. Take-away menus are provided and a lovely welcome hamper with local produce that can be upgraded to a luxury hamper for an extra charge. Toddler play house with picnic table and ride ons plus beach toys. Beauty therapist studio 2 minutes walk down the hill. 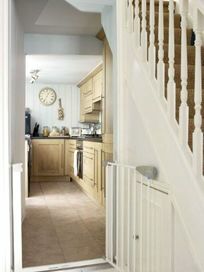 Stairgates provided top and bottom of stairs and garden steps gated too. Good-sized terrace garden with sea views, dining set, BBQ and bench. Plus play house and mini coupe car for little ones. Please note, there are a few stone steps up to the garden, although these are safely gated. Several public golf courses within 5-10minutes drive. Langland golf course is just a mile away. Open air tennis courts are a short walk away over looking the sea. 2 cots and highchairs available including travel and wooden cots, small and large highchair. Fabulous location, close to lots of amenities and beaches. Comfy cottage with loads of toys for the little ones. The welcome hamper was a lovely touch. This is a lovely cottage in a lovely part of the world. It's in a very convenient location for exploring the local area (which is stunning). 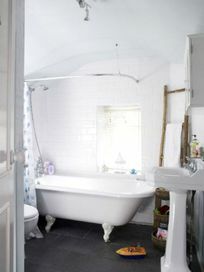 It was spotless upon arrival and is supplied with everything you need. It has a well-equipped kitchen, lots of baby toys, books, wooden cot, TV, DVD player, lots of DVDs, it even has Sky with pre-recorded Peppa! The owners also left a nice welcome pack of the essentials; bread, butter, eggs, orange juice, etc. and there are lots of supplies in the cupboards (pasta, baby food, beer, wine, etc.) that you can purchase at reasonable prices. It's up a very steep hill, so wouldn't be suitable for anybody with mobility issues or with twins in a buggy (it looks tough to push even one baby! ); other than that I'd recommend it to anyone. Great cottage, extremely well equipped. 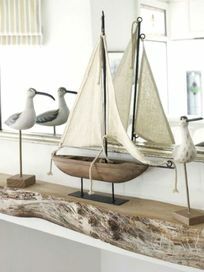 Lovely decor and very helpful owners. 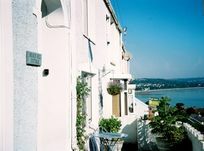 Beautiful area, stunning beaches and Mumbles has lots of nice restaurants and boutiques to offer. Highly recommend this holiday cottage for families. We loved our 7 night stay at the Beachill Cottage. It's set in an idyllic area not far from the wonderful coastal paths and a great starting point to visit the many bays in the Gower. The cottage itself is well equipped, a god-send when you have littles ones, there was even household essentials (washing powder, bin bags, etc) and food when we got there. 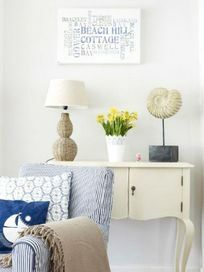 We settled into the cottage like it was our own home as it was warm, comfy and welcoming. There's plenty to do and would recommend the local chip shop and the restaurant Munch of Mumbles - a small walk down the hill. We would highly recommend a stay here and would definitely re-book in the future. We had a great stay and surprisingly good weather. Lovely beaches not far away and the mumbles itself was very child friendly and fun to explore. Ice cream cafes, castle, cycling along the promenade, pier, soft play cafe etc. Some lovely cafes and restaurants too, high standard of food everywhere. The house is decorated to a very high standard and very well equipped for children. Tripp trapp high chair and stokke cot, a few toys, kids cutlery and plates and cups and very handily an immaculate silver cross folding buggy. The stairs are very steep though and the top stair gate has a huge gap under it. Bit stressful if you've got an intrepid explorer like mine. And the stair gates themselves were the least user friendly I have ever encountered. It is also a VERY steep, narrow lane. Parking is pretty hideous. We bought the permit but two evenings couldn't get a space there. Made my husband grumpy all week! Just be warned. It's very handy for walking to things in the mumbles but we found it a slightly stressful location just because the hill is so steep. On balance we'd probably go back to the area but maybe stay somewhere else with easier parking and a bit more space. We had a lovely stay in Mumbles, in late January. The cottage was well-situated (pay for the parking permit) and we quickly got used to the hill! It's a great jumping off point for the rest of the Gower. The cottage was incredibly well stocked and we brought baby kit 'just in case', that we didn't actually need, e.g. a baby monitor. The owner was very welcoming and helpful (via text) and there was a useful comments book. Restaurants we recommend were the Junction (lovely walk along the bay) and Langland Brasserie. The food in Verdi's was great but it had zero atmosphere when we went, despite being busy. 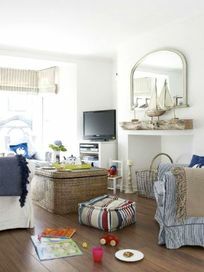 Property was beautifully kept and very well kitted out. Perfect for week at end of summer, extremely well stocked cottage, brought too much ourselves! Easy to access all the nearby beaches esp Langland bay and Caswell which are great places to spend the days. Great views towards to bay from the paved garden which was lovely to spend a but of time in the evening and good for our 2 year old to potter around in. This is a lovely quaint cottage with marvellous facilities & the best stocked kitchen I have ever seen. The location was fantastic for the bars & restaurants of Mumbles so no car needed. The hosts were quite lovely and everything was very clear in how to access the property. The home is up on a steep hill with a quick walk to the town and the waterfront. The property was as described and as photographed. The cottage was so charming, very snug and cosy for a February holiday. There were plenty of little toys and books to keep them entertained when we were in. Bit of a steep hill to the cottage for little legs but my 3 are all good little walkers so it wasn't an issue for them. We loved this cottage - equipped with so much stuff for babies and us - it didn't matter that we forgot to bring a lot of things. A very enjoyable stay! The cottage was a fantastic base to explore the Gower. The area was fantastic, there were so many beaches to chose from - that they weren't overcrowded. There are some fantastic places to eat in Mumbles and the surrounding area. We all slept really well in the cottage - the cot was perfect for our 16m daughter, who doesn't sleep well in travel cots - so it was well worth paying the premium for us. 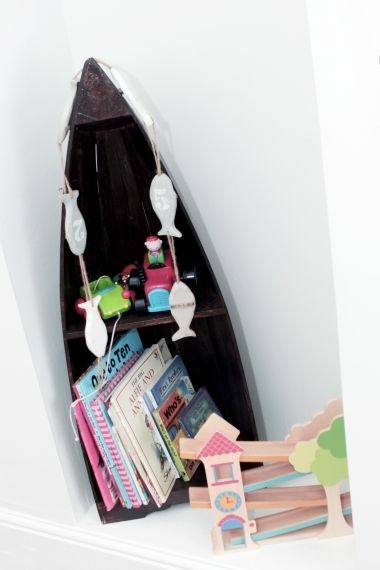 THere are lots of thoughtful touches in the cottage, such as crayons, books, garden games. 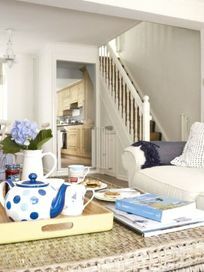 PLease be warned that the cottage is up a rather daunting hill... it does allow an extra guilt free cake or two though! The hill isn't an issue - but you really must invest in the parking permit as not having a parking space would really have changed my thoughts on the hill! Lovely place, plenty of room. a lovely property, really well kitted out for staying there with small children. There was everything we needed and more and it was very child friendly. We had a wonderful time in the cottage and may well come back again next year. Lovely cottage, wonderful sea views to the side from the sitting room arm chair and bedroom as well as back garden and as you enter and leave the cottage. Great location - the cottage is on a steep hill but you can drive the long way round (via the coast) avoiding the hill. Well equipped for babies and toddlers - great take aways nearby and plenty of beaches - all a short drive away. Car necessary. Mumbles a great holiday location for small children! Would definitely recommend. Amazing selection of fun toys, buggy available and in the garden and playhouses which our little daughter loved! This is a really lovely house in a wonderful location. 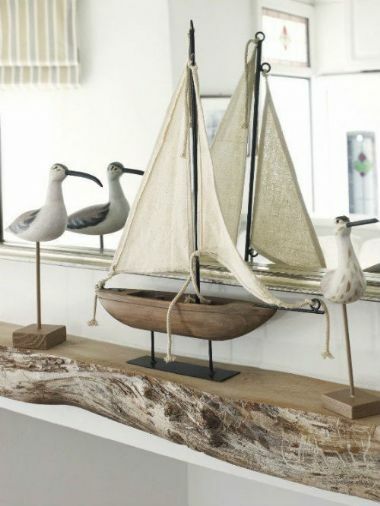 The interior is grown-up and chic so you feel you're somewhere special for your holidays but toys and useful toddler/baby equipment is tucked away everywhere. There is everything you can think of plus a few extras you'd have forgotten anyway. We were really impressed and had a wonderful week. There are sea views from the terraced garden and from the bay window. The main promenade is just 5 minutes down the hill where you can visit the posh shops, deli and fishmonger, or stroll along to the pier and retro cafe at one end, or the lido and playground at the other. Go up the hill and you're spoilt for lovely sandy bays with rock pools, great cafes and Joe's ice-cream, or at Langland a fab bistro which couldn't have been more accommodating of our tired, sandy toddler. You really won't regret booking here. It has given us some wonderful first proper family holiday memories. I recommend booking the parking permit and the yummy local deli hamper. 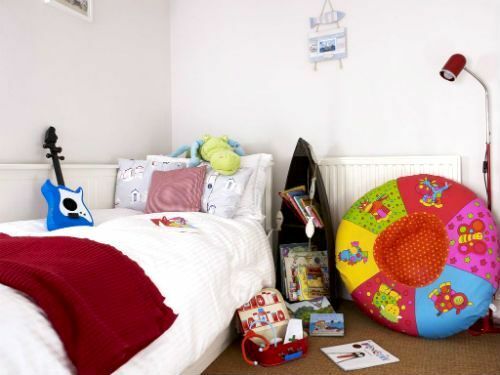 Beautiful cottage with great toys and baby gear. Hill us very steep but short especially if you take the right hand fork on the way down... Certainly a great way to feel less guilty about all the delicious ice cream from Joe's parlour at the bottom of the hill! Highly recommended! Would holiday in beachhill cottage again! Beautiful throughout and loads of useful baby stuff! Will be recommending to our friends with kids! 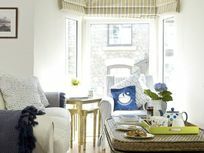 Lovely little cottage - warm and cosy, with really nice furnishings. None of that "owner never stays here" feeling about it. Plenty of toys and books available too, and a nice bottle of wine and a few other nice provisions on arrival. We felt really cared for. We accidentally left some wellies behind and they were posted to us within days. Highly recommended. Fantastic stay at Beach Hill Cottage. Despite the appalling weather we had a lovely time. The owners have thought of everything to make the house as baby/toddler friendly as possible. There are plenty of toys, books, bedding, towels - even a dressing up box and bath toys! The house comes equipped with pretty much everything you need which made our packing much easier. We could actually have brought less. The master bedroom is grown up and comfortable and the open plan dining/sitting room is relaxing, spacious and full of light. And the location is fantastic. Mumbles is lovely and the Gower Peninsula is breathtaking. Amazing beaches - even in October! We thoroughly recommend it - even for a rainy October stay! A beautiful, tasteful cottage with everything you could need! Nice Cottage with friendly, helpful owners and neighbours. Plenty to do in the mumbles for a short break. Be sure to explore Gower for some lovely scenery and beaches. Cottage situated part way up a steep hill with parking nearby (not outside property). Cottage is tastefully decorated, lots of toys for children, quality appliances (inc washer/dryer) all nice touches you would expect from a BF bolthole. Only criticism is the musty smell, especially in the kitchen. 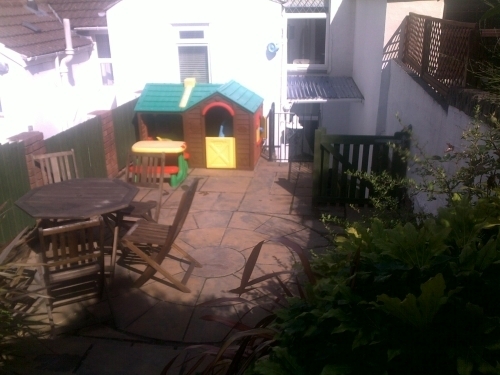 This is a very well located property up a rather narrow, steep street but in the heart of Mumbles. It is well equipped and comfortable and we had a lovely stay here. There is loads to do in the local area which is fantastic for kids, with beautiful, flat, sandy, gently sloping beaches, miles of flat cycling paths along the bay, parks, pitch and put, boat trips, pier and on a wet day there's a fabulous Water Park in Swansea a 15 minute (max) drive away but do book in advance to avoid long queues. 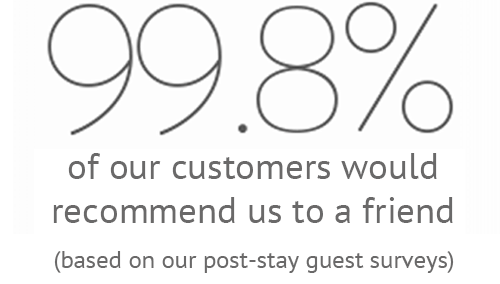 We loved our stay here and would recommend it to anyone with young children. a word of warning, do access the parking bay for the house around the back route and cheekily travel 10m down a one way street, the house is positioned up a short but very narrow hill - not for a faint hearted driver! The accomodation is lovely in itself. although the washing machine was not working, the Garden area is more a raised patio. 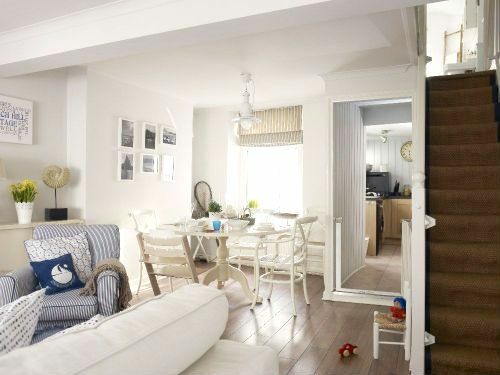 Mumbles and area is lovely for families, However, the location of the cottage and deep steps to the door are not baby/child friendly. We had a lovely stay at the cottage and thoroughly recommend it. It was in a great location (on a hill overlooking the beautiful bay and had no problem with accessibilty). Cottage was perfectly set up for a family. Lots of things for baby including cot, toys inside and out, steriliser etc The owner was really helpful and I would definitely stay again. This property provided a very comfortable home-from-home for our week in Wales. 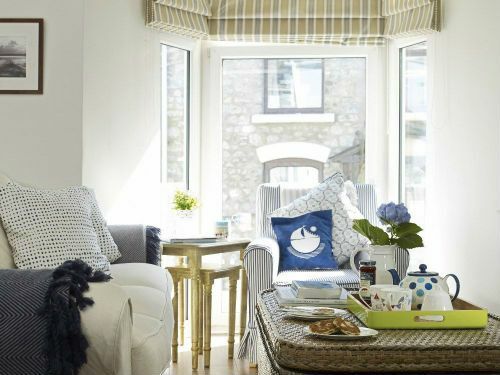 A lot of care and attention has been invested in making the cottage easy for parents to use so you can focus on your holiday from the minute you walk through the door. Nice touches that go the extra mile include wireless networking, HD satellite television, Wii and games and a DVD player so if you choose not to go out in the evening, there is plenty to entertain you at the cottage. A wonderful cottage in Mumbles - a short (but steep!) walk up from the town... a good thing, given how many fantastic places for coffee and cake we found. House was wonderful - everything you could ask for. Great toys and dressing up outfits for the kids, a lovely outdoor area, everything safe and stair-gated... excellent, we had a fabulous time and will hopefully be back again. This cottage was very well equipped and had everything that we needed. My 1 year old was safe as there were baby gates exactly where they needed to be and I though the cottage was beautifully presented and clean. I appreciated the quality of the linen and thought the welcome basket and honesty cupboard were brilliant! The only thing is that my little girl now adores Welsh Cakes...and so do I! The only reason the location did not get 5 stars for me is because the property is on a really steep hill and can be a little tricky to get your pushchair down as it is pretty narrow in some places and if there is a vehicle passing there is not really space for you to get out of the way. This did not however take away from the general experience and I would happily return again. Lovely well kept property, good location for walking to the beach. We were well looked after by Marie before and throughout our stay. 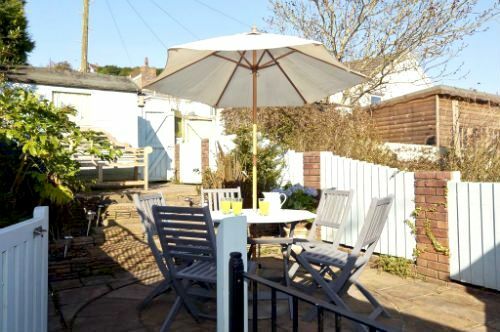 A lovely cottage a few minutes walk from the Mumbles promenade and perfectly located for easy access to the Gower peninsular. Helpful owners who provided comprehensive information about the property. A great retreat. Charming little cottage, with the perfect mix of serenity but close proximity to the shops, pubs and ice-cream parlours of Mumbles. A great base to enjoy the spectacular beaches of The Gower. Felt like a home from home. Overall an enjoyable stay and the cottage is in a great location. Very quiet, friendly neighbours, good eateries nearby. The playground located at the bottom of the hill (about a 6 min walk away is excellent. A lovely laid-back cottage, in a brilliant location for a family holiday. Lots of great places to eat out, with small children made to feel really welcome and simply stunning beaches. Our girls (3 and 5 years old) adored the dressing up clothes and garden playhouse. The Owners are very friendly and the the accommodation is very stylish. Lovely property, great location would love to stay again. Also recommended property to friends. 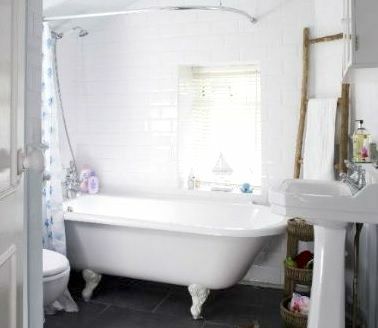 We loved the cottage, and the facilities were excellent for little ones e.g. availability of toys, children books, etc. The rooms were decorated to a high standard, and all equipment were very good. The Mumbles area was beautiful - Langland Bay was fantastic and very child friendly. Superb accommodation,great facilities, a true home from home in a picturesque setting. The property was not as clean as it should have been when we arrived. Also we were told that if we ordered a grocery delivery to arrive between 12 and 2 on the day of our arrival the change over staff would take delivery of it - however they were not there so we missed delivery of our groceries. However the property itself was lovely and very well equiped for our son. Owner Responds: Unfortunately, our cleaner had a unexpected personal issue that day which resulted in the changeover not being at the usual time or quite the usual very high standard. We offered to send the cleaners back the next day when the guests were out but they declined. I believe the groceries were re-delivered a little later. We are sorry their experience was less than perfect and have taken steps to prevent this happening again.